Lesser metatarsal-phalangeal joint fusion is a less common but highly effective adjunct procedure for the treatment of the complex hammer digit. The complex hammer digit is a multi-planar deformity that presents as a flexion contracture of the digit with subluxation or dislocation of the metatarsal-phalangeal joint (Fig. 26.1 complex hammer digit). This is distinguished from the simple hammer digit that presents as a flexion contracture of the digit without metatarsal-phalangeal joint instability (Fig. 26.2 simple hammer digit). Metatarsal-phalangeal joint pathology is not only the hallmark difference between the complex and simple hammer digits but the critical indication for adjunct procedures that stabilize the metatarsal-phalangeal joint when performing hammer digit correction surgery. 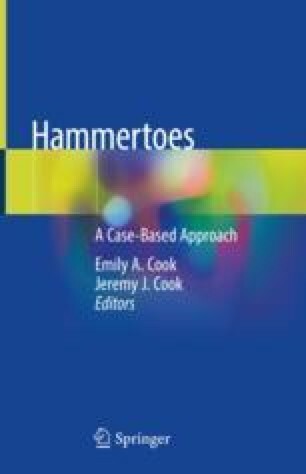 Neglect of metatarsal-phalangeal joint instability when surgically correcting the complex hammer digit may result in a higher incidence of floating toe syndrome or recurrence of deformity. Hence joint fusion and techniques such as plantar plate repair and flexor tendon transfer procedures are essential for the treatment of the complex hammer digit.